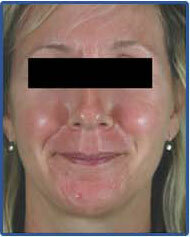 Rosacea can cause both temporary and prolonged facial redness. Many people will say that they always look flushed, but then with a flare up, they get downright red and their skin may even feel uncomfortable. Sometimes, a person with Rosacea will know what makes it worse. A glass of wine with dinner or a heavy workout can mean a flare up is headed their way. Triggers such as these may be easy to figure out, but many people don’t know or have a hard time figuring out what’s aggravating their Rosacea. 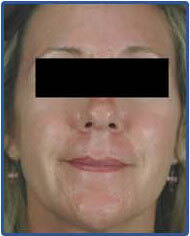 Regardless, laser treatment for Rosacea can really help improve the baseline color of your skin. The reason it works is because the laser we use at Celibre Medical is an FDA approved, state-of-the-art pulsed dye laser that targets the hemoglobin (oxygen carrying component) of red blood cells. Rosacea causes an increase in the number and size of the blood vessels in the facial skin, so it’s a condition that can be easily treated with this type of laser. And because the target structure is beneath the skin’s surface, there’s no disruption of the surface at all, so there’s very little downtime afterward, if any at all. The blood in the unwanted vessels absorbs the laser energy and the heat that’s created damages its walls. The vessel then essentially collapses and is no longer functional. With that, the body breaks it down and it goes away. Even one full-face treatment will make a noticeable difference, but a series of treatments is usually necessary to see maximum redness reduction. Each Rosacea treatment usually takes between 15 and 60 minutes. The laser energy can feel like a hot, rubber band snap on your skin as the laser is fired. Most patients find the treatments very tolerable. Generally, you may look a little redder immediately after treatment. If you have really severe rosacea or if we choose an aggressive treatment, then you may have some degree of bruising after laser treatment that means a bit more downtime for you. Let one of our experienced and highly trained laser experts meet with you and get you started on a plan for laser treatment of your embarrassing rosacea. We have treatments available in either of our comfortable offices in Los Angeles or Orange County. Don’t hesitate or put it off any longer. Give us a call today! Contact us today to schedule a FREE Rosacea consultation!